One can never take too many precautionary measures to protect against the dangers of the sun. Although the application of sunscreen to the face is an important step, it does not stop there. 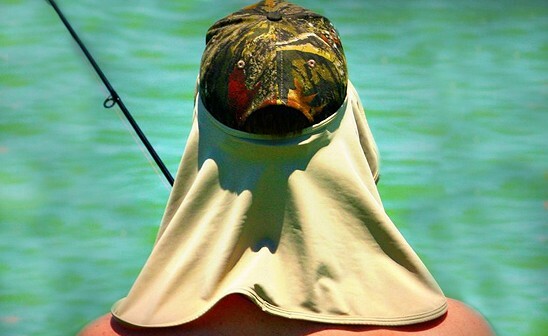 The Sun Mullet, a practical sun protective product guards the often-missed areas of the neck and back. Joe Martin, one of the partners of Sun Mullet, has had four family members battle skin cancers, and he wants to protect future family members and others from having to go through the same struggles. The Sun Mullet does that. The Sun Mullet is the most cost-effective and practical, multi-use sunshade on the market. This versatile and functional skirt like attachment looks cool and can be worn with a baseball cap, attached to your sunglasses, or even folded up to make a headband or bandana. Made of lightweight stretchy material, the shade is one size for all ages. Its patented design allows the wearer comfortable and convenient UV blockage during any outdoor activity. Whether worn with a hat, sunglasses or other form of headwear, the Sun Mullet provides UPF 50+ protection in the sun. Sun Mullet, LLC. offers an exciting new sun protective product to guard you against the dangers of the sun. One can never take too many precautionary measures to protect against the dangers of the sun. Although the application of sunscreen to the face is an important step, it does not stop there. The Sun Mullet, a practical sun protective product guards the often-missed areas of the neck and back. Joe Martin, one of the partners of Sun Mullet, has had four family members battle skin cancers, and he wants to protect future family members and others from having to go through the same struggles. The Sun Mullet does that. The Sun Mullet is the most cost-effective and practical, multi-use sunshade on the market. This versatile and functional skirt like attachment looks cool and can be worn with a baseball cap, attached to your sunglasses, or even folded up to make a headband or bandana. Made of lightweight stretchy material, the shade is one size for all ages. Its patented design allows the wearer comfortable and convenient UV blockage during any outdoor activity.